L-arginine plays important roles in the metabolism of an organism. It is the precursor for the synthesis of proteins and other molecules of great biological importance. For young organisms L-arginine is an essential amino acid for optimal growth and development. Therefore it must be provided in the diet. For adults, L-arginine is a semi-essential or conditionally essential amino acid, especially in such conditions as trauma, burn injury, smallbowel resection, and renal failure . In adults, L-arginine is produced in the kidney from circulating citrulline synthesized by enterocytes in the small intestine . Renal L-arginine synthesis is regulated by L-arginine plasma levels. L-arginine is synthesized in the proximal tubule of the kidney thus renal ischemia reperfusion injury as seen after shock, trauma and major vascular surgery, leading to acute tubular necrosis, might reduce Larginine production . Several experimental studies have revealed that the administration of L-arginine can reduce renal ischemia reperfusion injury to skeletal muscle, kidney, liver, heart and brain. Moreover, L-arginine administration improves cardiovascular, pulmonary, immune, digestive functions, protects against the early stages of cancerogenesis and causes protective hemodynamic alterations. However, in situations with a stimulated inducible nitric oxide synthase (iNOS), the administration of large amounts of L-arginine is considered to be hazardous for the patients [1,4]. L-arginine is beneficial in the treatment of hepatic injury , hepatic cirrhosis, fatty liver degeneration [6-8] and diabetic nephropathy [9,10]. In several studies, administration of exogenous L-arginine has been shown to protect the kidney against toxic or ischemic injury. The molecular mechanisms for these beneficial effects are unclear . Carbon tetrachloride (CCl4) administration produces pathological changes not only in liver but also in different organs . The exposure to CCl4 showed significant alterations in the lipolytic activities of liver, adipose tissue and kidney . CCl4 induces oxidative stress via the production of free peroxy radicals and lipoperoxides thereby damaging proteins, DNA and lipids . The involvement of free radical-mediated oxidative process in the development of CCl4 hepatotoxicity is well established . It was reported that impairment of hepatic antioxidant status is associated with a substantial heaptocellular damage induced by CCl4 . GSH is a crucial determinant of tissue susceptibility to oxidative damage, and the depletion of hepatic GSH content was shown to be associated with the enhanced toxicity of chemicals including CCl4 . Liver is the main target for CCl4 toxicity while the kidney is the main site of CCl4 accumulation. The pathogenesis of CCl4-induced renal dysfunction is not completely understood . Whether the induction of renal dysfunction caused by CCl4 is dependent on the functional status of the liver or not is still under investigation. Larginine was found to be effective in the treatment of CCl4-induced hepatic injury . Accordingly, the present study was conducted to: 1) investigate whether a single dose of CCl4 (20 mg/kg body weight) can induce renal dysfunction along with hepatic injury and 2) to examine the ability of L-arginine to treat such conditions via monitoring the kidney lipid peroxide level and activities of antioxidant enzymes (SOD, catalase, GR, GPx and GST). CCl4 and L-arginine were obtained from Sigma Chemical Co. (St. Louis, MO, USA). All other chemicals used throughout this investigation were of the highest analytical grade commercially available. Forty female Swiss albino mice (25 ± 2 gm) obtained from Theodor Bilharz Research Institute, Cairo (Egypt) were used in this experiment. The experiment was performed according to the approved ethical rules. The animals were housed for about one month prior to experimental use. All mice were housed under constant conditions of a 12-hour light/dark cycle in a temperature and humidity controlled room, and were maintained according to the criteria outlined in the “Guide for the Care and Use of Laboratory Animals” prepared by the National Academy of Sciences and published by the National Institutes of Health . Food and water ad libitum were allowed. The animals were randomly divided into 4 groups of 10 mice each. CCl4 group; received a 6-day repeated oral dose of Tween 80 (1 ml/kg) diluted in distilled water (1%, v/v) then mice were injected with a single dose of CCl4 (20 mg/kg body weight, intraperitoneally (i.p.)) dissolved in corn oil (2%, v/v) as described previously [20,21] and sacrificed after 24 h of CCl4 injection. For protection group, mice were orally supplemented with a dose of Larginine (200 mg) in 1 ml Tween/kg body weight/day for 6 days, then injected i.p. with a single dose of CCl4 (20 mg/kg body weight) and sacrificed 24 h later. For curative group; mice were injected i.p. with a single dose of CCl4 (20 mg/kg body weight), then after 24 h mice were orally treated with 200 mg L-arginine in 1 ml Tween/kg body weight/day for 6 days, then sacrificed. Finally, normal control group was fed with the control diet and received the respective vehicles only (received a 6-day repeated oral dose of 1% Tween 80 (1 ml/kg) then a single i.p. dose of corn oil was injected then mice were sacrificed 24 h later). The animals of each group were sacrificed by decapitation at the end of the 8th day of the experiment. Blood samples were collected and serum was separated by centrifugation at 5000 rpm, for 10 min and stored at 4˚C. The kidneys were removed by dissection, rapidly rinsed with ice-cold saline and dried on filter paper, homogenized in 0.9% NaCl solution using a homogenizer and the resultant homogenate (10%, w/v) was then centrifuged at 5000 rpm for 15 min at 4˚C and the resultant supernatant was used for the determination of biochemical parameters. Serum creatinine was measured to assess kidney function using Jaffe alkaline picrate method (Randox, UK) . GSH content was estimated spectrophotometrically at 412 nm, using Ellman’s reagent as described previously . The enzyme GPx (EC 1.11.1.9) activity was determined by its ability to catalyze the oxidation of GSH by t-butylhydroperoxide, in the presence of glutathione reductase and NADPH. The oxidized glutathione was then immediately converted to the reduced form with a concomitant oxidation of NADPH to NADP+ and the decrease in absorbance was measured at 340 nm . GR (EC 1.8.1.7) activity was estimated by following the decrease in absorbance at 340 nm due to the oxidation of NADPH to NADP+ accompanied with the reduction of GSSG . The activity of GST (EC 2.5.1.18) was determined by measurement of the rate of GSH conjugation with 1-chloro-2,4-dinitrobenzene as substrate . Activity of SOD (EC 1.15.1.1) enzyme was estimated by the degree of inhibition of the reduction of nitroblue tetrazolium dye mediated by phenazine methosulfate . Catalase (EC 1.11.1.6) activity was kinetically measured by monitoring the rate of decomposition of hydrogen peroxide as substrate . The level of MDA, as an end product of lipid peroxidation, was determined by its ability to react with thiobarbituric acid forming a 1:2 adduct . Protein concentration was determined using the Bradford method with bovine serum albumin as the standard . The results are expressed as mean ± SD. Statistical analysis between two groups was performed using Student’s t-test; P < 0.05 was considered statistically significant. The data were analyzed with GraphPad InStat version 2.03 (GraphPad Software, Inc., CA, USA). CCl4 injection resulted in a significant increase in serum creatinine level compared with those of the control group. On the other hand, preor post-administration of L-arginine resulted in a significant decrease in the serum creatinine level (Table 1). 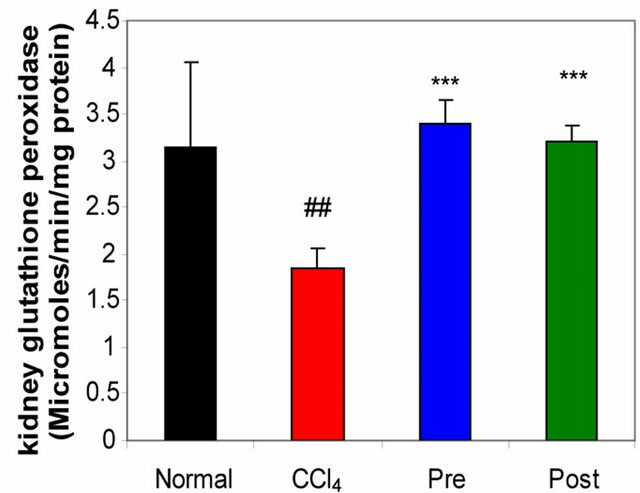 MDA level, as a marker of free radical mediated lipid peroxidation injury, was significantly elevated in the kidney homogenate of CCl4-intoxicated mice compared with that of the normal group and it was significantly decreased by preor post-treatment with L-arginine to back again around the normal range. On contrary, renal GSH level was significantly decreased in CCl4-intoxicated mice as compared with the normal group and it was significantly increased by both pre and post-administration of L-arginine (Table 2). GR, GPx, GST, catalase and SOD (antioxidant enzymes) were evaluated as an index of antioxidant status of tissues. As shown in Figures 1-3, renal activities of GR, GPx, GST, catalase and SOD enzymes were significantly inhibited by CCl4 intoxication compared with those of normal mice group. 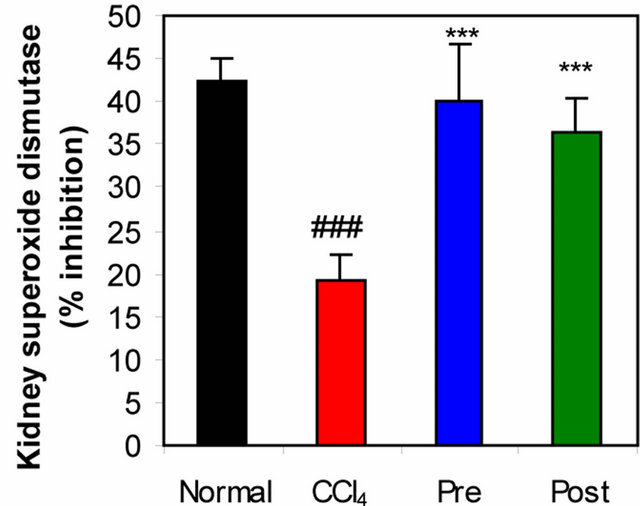 The activities of the antioxidant enzymes were significantly enhanced by pre-treatment or post-treatment of CCl4-intoxicated mice with L-arginine compared with those of untreated CCl4-intoxicated mice group. Table 1. 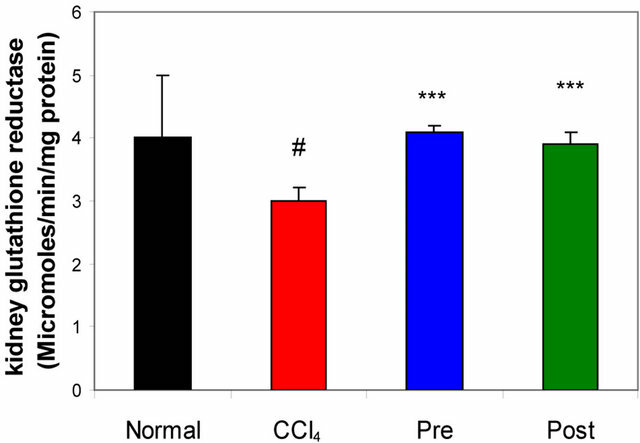 Effects of CCl4 intoxication and preor post-treatment with L-arginine on serum creatinine level of mice with CCl4- induced hepatic injury. Each value represents the mean ± SD of ten mice. *Significant difference at P < 0.001 level compared with the normal group. 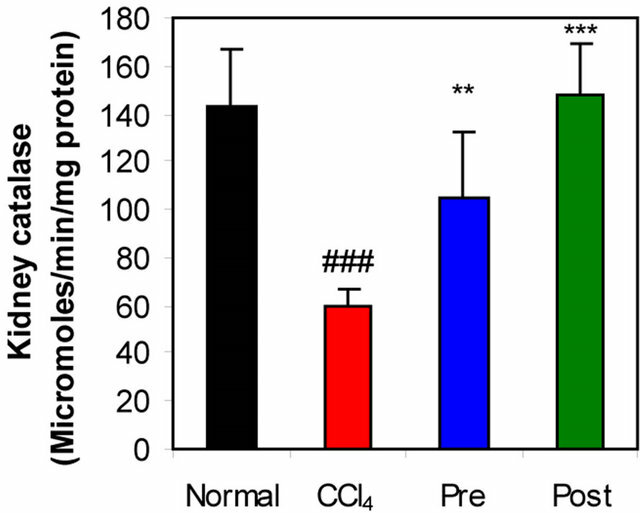 !Significant difference at P < 0.001 level compared with the CCl4 group. L-arginine against the acute intoxication of CCl4 (data not shown). Acute and chronic renal damage are also very common pathophysiologic disturbances caused by CCl4 [31, 34]. Repeated administration of CCl4 to the experimental animals not only produces liver cirrhosis but also pathological changes in different organs such as lung, spleen and kidneys . In the current supplementary study, and in accordance with others , elevated level of serum creatinine was taken as a presumptive marker of lesions in kidneys. Bhadauria et al. , reported that administration of CCl4 altered various diagnostically important biochemical variables in rats and multiple treatment of propolis significantly inhibited lipid peroxidation and markedly enhanced glutathione in liver and kidney. Dogukan et al. showed that oxidative stress plays a role in CCl4-induced renal injury. Ogeturk et al. found that kidney MDA levels were increased significantly following CCl4 exposure. In the study of Tirkey et al. , thiobarbituric acid reactive substances (TBARS) levels were significantly increased whereas GSH, SOD and catalase levels were decreased in the liver and kidney homogenates of CCl4-intoxicated rats. The present study showed a significant increase (P < 0.001) of MDA in the mice kidney homogenate whereas a significant decrease (P < 0.001) of the renal GSH was observed compared to those of the normal control after injection of a single dose of CCl4 that induced the acute hepatic injury. Moreover, the results showed that CCl4 intoxication significantly decreased renal activities of antioxidant enzymes (SOD, catalase, GPx, GST and GR) as compared to normal mice. These results were in accordance with those of Shi et al. . These data revealed that, increased level of free radicals is associated with decreased antioxidant status in liver and kidney of animals treated with CCl4. This finding is similar to others [39,40]. Moreover, these results demonstrate that the single CCl4 dose (20 mg/kg body weight) is able to induce both hepatic injury and kidney dysfunction suggesting that the effect of CCl4 on kidney function depends on the functional status of the liver which is in accordance with other observations reported previously . Furthermore, the alteration in the antioxidant enzyme activities may be relevant to the ability of the liver and kidney to cope with oxidative stress after CCl4 poisoning. Table 2. Effects of CCl4 intoxication and preor post-treatment with L-arginine on renal MDA and renal GSH levels of mice with CCl4-induced hepatic injury. Figure 1. Effects of preor post-treatment with L-arginine on the renal superoxide dismutase activity (a) and the renal catalase activity (b) in CCl4-induced hepatic injury in mice. Each bar represents the mean ± SD of ten mice. ###Significant difference at P < 0.001 level compared with the normal group. **, ***Significant difference at P < 0.01 and at P < 0.001 levels compared with the CCl4 group, respectively. Figure 2. Effects of preor post-treatment with L-arginine on the renal glutathione peroxidase activity (a) and the renal glutathione-S-transferase activity (b) in CCl4-induced hepatic injury in mice. Each bar represents the mean ± SD of ten mice. ##, ###Significant difference at P < 0.01 and at P < 0.001 levels compared with the normal group, respectively. **, ***Significant difference at P < 0.01 and at P < 0.001 levels compared with the CCl4 group, respectively. observed that oral administration of L-arginine before cyclosporine (CsA) injection produced a significant protection against nephrotoxity induced by CsA, prevented the rise of MDA as well as reduction of GPx activity and reduced GSH content in kidney tissue. These suggested that, L-arginine can ameliorate kidney dysfunction. In another study of Saleh and El-Demerdash , they reported that cisplatin induced an increase in the level of lipid peroxides and oxidized glutathione and a depletion of GSH. The activities of the antioxidant enzymes GPx and SOD were also lowered. L-arginine significantly attenuated the oxidative stress and nephrotoxic effect of cisplatin. The present study revealed that L-arginine treatment significantly decreased renal MDA level while enhanced renal GSH levels and increased the activities of antioxidant enzymes (SOD, catalase, GPx, GST and GR). 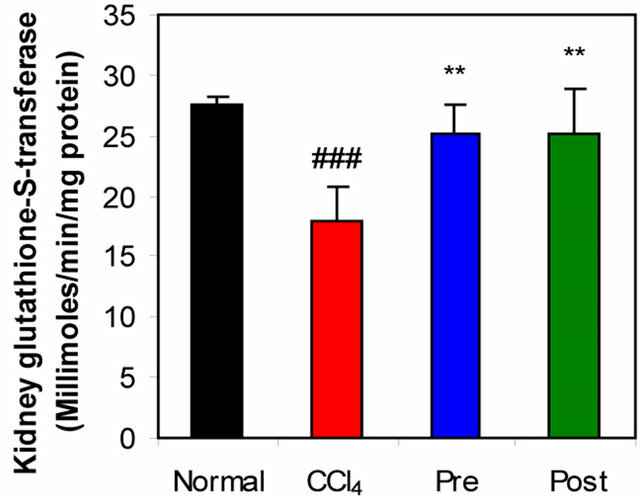 The toxicity of CCl4 can be explained on the basis of oxidative stress. These results indicated that besides the heaptoprotective and hepatocurative action of L-arginine , it can ameliorate the kidney dysfunction and that was related to the improvement of the functional status of the liver. Figure 3. Effects of preor post-treatment with L-arginine on the renal glutathione reductase activity in CCl4-induced hepatic injury in mice. Each bar represents the mean ± SD of ten mice. #Significant difference at P < 0.05 level compared with the normal group. ***Significant difference at P < 0.001 level compared with the CCl4 group. mg/kg body weight) is able to induce hepatic injury and kidney dysfunction. In addition, the effect of CCl4 on kidney function depends on the functional status of the liver. L-arginine has protective effects on both liver and kidney against CCl4 toxicity and these protective effects can be interpreted via the inhibition of CCl4 derived free radicals production and the enhancement of antioxidant enzymes activities as well as through the antioxidant effects of L-arginine itself. Thus, clinical application of Larginine should be considered in cases with hepatic and renal CCl4-induced injury. Scibior, D. and Czeczot, H. (2004) Arginine-metabolism and functions in the human organism. Postępy Higieny i Medycyny Doświadczalnej, 58, 321-332. Wouter, J., Karin, L., Anje, A., Sander, J.H., Martijn, A., Reina, E., Jan, M., Marinus, C. and Wouter, H. (2002) Arginine deficiency affects early B cell maturation and lymphoid organ development in transgenic mice. Journal of Clinical Investigation, 110, 1539-1548. Balch, M.D., James, F., Balch, C.N.C. and Phyllis, A. (1997) Prescription for nutritional healing. 2nd Edition, Avery Publishing Group, Garden City Park, 35-36. Bravermanm, E.R. (1997) The healing nutrients. Keats Publishing, Inc., New Canaan, 18-23. Hendler, M.D. and Saul, S. (1990) The doctor’s vitamin and mineral encyclopedia. Fireside, New York, 209-215. Huang, K.H., Pai, M.H., Wu, C.H., Liu, J.J. and Yeh, S.L. (2010) Supplemental dietary arginine reduces renal RAGE expression and oxidative damage in rats with streptozotocin-induced type 2 diabetes. European e-Journal of Clinical Nutrition and Metabolism, 5, e77-e84. Cherla, G. and Jaimes, E.A. (2004) Role of L-arginine in the pathogenesis and treatment of renal disease. Journal of Nutrition, 134, 2801S-2806S. Dashti, H., Behbehani, A., Abul, H., Hussain, T. and Madda, P. (1995) Alterations of trace elements in kidney, spleen and lungs in treated and untreated experimental liver cirrhosis. Journal of the Royal College of Surgeons of Edinburgh, 40, 173-179. Patil, S., Kanase, A. and Varute, A.T. (1989) Effect of hepatoprotective ayurvedic drugs on lipases following CCl4 induced hepatic injury in rats. Indian Journal of Experimental Biology, 27, 955-958. Khan, M.R. and Younus, T. (2011) Prevention of CCl4- induced oxidative damage in adrenal gland by Digera muricata extract in rat. Journal of Pharmaceutical Sciences, 24, 469-473. Dogukan, A., Akpolat, N., Celiker, H., Ilhan, N., Bahçecioglu, I.H. and Günal, A.I. (2003) Protective effect of interferon-α on carbon tetrachloride-induced nephrotoxicity. Journal of Nephrology, 16, 81-84. National Institutes of Health (1996) Guide for the care and use of laboratory animals. 7th Edition, National Academy Press, Washington DC. Bartels, H. and Boehmer, M. (1971) Microdetermination of creatinine. Clinica Chimica Acta, 32, 81. Beutler, E., Duron, O. and Kelly, B.M. (1963) Improved method for the determination of blood glutathione. Journal of Laboratory and Clinical Medicine, 61, 882-888. Beutler, E. (1975) Glutathione peroxidase. In: Beutler, E., Ed., Red Cell Metabolism: A Manual of Biochemical Methods, Grune & Stratton, New York, 71-73. Habig, W.H., Pablst, M.J. and Jakoby, W.B. (1974) Glutathione-S-transferases. The first enzymatic step in mercapturic acid formation. Journal of Biological Chemistry, 249, 7130-7139. Sadiq, S., Nagi, A.H., Shahzad, M. and Zia, A. (2010) The reno-protective effect of aqueous extract of Carum carvi (black zeera) seeds in streptozotocin induced diabetic nephropathy in rodents. Saudi Journal of Kidney Diseases and Transplantation, 21, 1058-1065. Shi, Z.M., Feng, P., Jiang, D.Q. and Wang, X.J. (2006) Mistletoe alkali inhibits peroxidation in rat liver and kidney. World Journal of Gastroenterology, 12, 4052-4055.